WASHINGTON, D.C. – U.S. Senators Thom Tillis (R-NC) and Amy Klobuchar (D-MN) reintroduced the Newborn Care Improvement Act, bipartisan legislation that would double the number of days veterans receive care for their newborns from 7 to 14. Currently, a veteran must find outside healthcare for their child within seven days of birth or the baby will not have health insurance. Tillis and Klobuchar have led Senate efforts to support our troops when they return home and improve healthcare for our nation’s servicemembers and veterans. In September, provisions based on their Helping Veterans Exposed to Burn Pits Act were included in the Senate and House-passed Energy and Water, Legislative Branch, and Military Construction and Veterans Affairs Appropriations Act. The bipartisan legislation will create a Center of Excellence in the Department of Veterans Affairs (VA) focused on researching the health effects associated with burn pits and treating veterans who become sick after exposure. 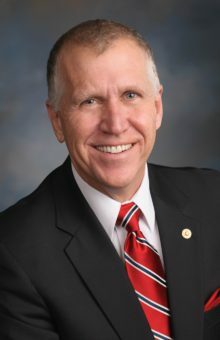 Last year, Tillis and Klobuchar introduced the Savings for Servicemembers Act aimed at reducing the travel minimum to 50 miles, which would align the treatment of National Guard and Reservists with federal workers who have a 50 mile minimum for travel compensation, and reduce the cost of service to those in the Guard and Reserves. Every month, members of the National Guard travel to complete their required duty training and typically pay for travel out of their own pocket. Currently members can only claim their mileage and other travel expenses on their taxes if they travel over 100 miles from their residence for training or if travel expenses exceed two percent of a soldier’s adjusted gross income.